Look what has come back! 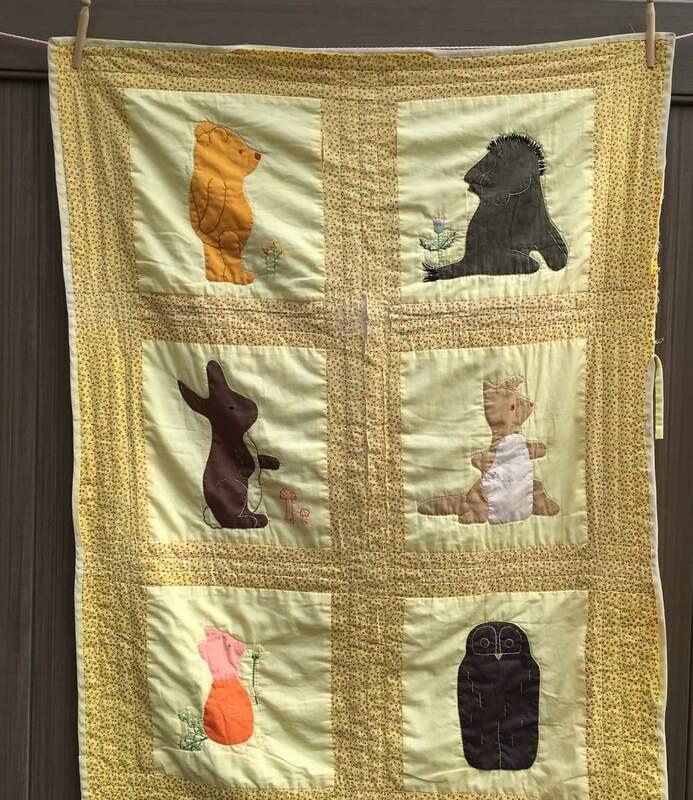 I made this quilt in 1974, drawing the characters from AA Milne's Winnie the Pooh books and appliqueing the cut out shapes on this baby quilt. The blocks are cotton poly--that was the fabric available in a wide variety of colors at the time. The sashing is 100% cotton with a calico print. I used polyester thread to sew the quilt together and waxed cotton hand-quilting thread to do the quilting by hand. The quilt was well loved and has come back for a re-make/rehab. All the of the cotton poly fabric looks great and has held up very well. The cotton quilting thread has shredded the calico sashing in the center of the quilt. The embroidered details are vary from "great" to "gone". Here are photos of the damaged cotton and the labels (my initials, the last name of the baby and the date) on embroidered on the back of the quilt. I thought a lot about what to do with this quilt. Normally I wouldn't take on a project like this, but it feels OK since I made the quilt. And the quilt's original, now middle aged owner, and her mother who has commissioned the re-make, gave me free reign to do whatever made sense. I thought about leaving the quilt as is and sewing a new sashing on top of the old calico by hand. I think that would have been the most honest way to restore the quilt. It would be patched, but the original quilt would still be there if the patching were removed. But this isn't a museum piece. The goal of the rehab is really to put this quilt back into use by the next generation of children. So taking it all apart and remaking it is what I plan to do. The 70s wasn't that long ago, so the ubiquitous calicoes of that era aren't yet being reproduced. Since I'm not trying to restore the quilt, I don't feel the need to hunt for vintage fabric. I'm going to use modern quilting cotton! It will be a whole new look! I'm currently very carefully un-sewing the appliqued blocks. I'll keep you posted on my progress. It will be interesting to see what this old fabric tolerates what the totally remade quilt looks like!